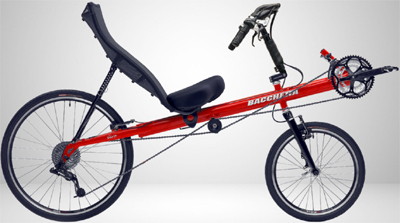 The Bacchetta Giro A-series A20 and A26 short wheelbase recumbents put Bacchetta’s design advantages into lightweight, well-spec’ed aluminum frames. The Giro A-series takes the all-purpose Giro model and renders it in an aluminum frame with upgraded components. These two bikes are similar enough to introduce together, but they are not the same frame. 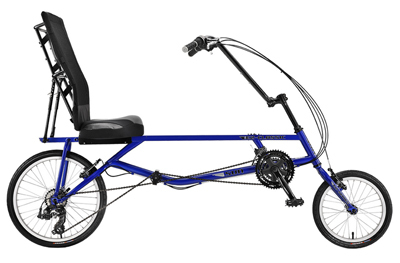 The A26 has a slightly different frame geometry to accommodate the larger 26″ front wheel. 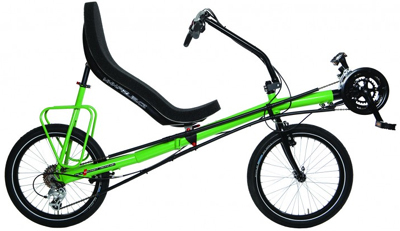 The A20 follows the Giro 20 in being an accessible and sporty recumbent bike, iconically so. There has always been bikes like this around Easy Street. In the 1990’s it was the Vision R-series bikes. 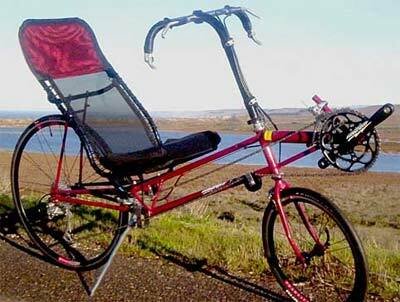 Then in the 2000’s it was the Rans V-Rex. We discovered the quality of Bacchetta’s workmanship and value built in soon after they started production. You can get the Giro 20 in a lower cost steel frame, the Giro A-series are what we stock. The Giro A26 introduces a modern type of short wheelbase, the high-racer. It has the aesthetic appeal of the two big wheels, the smoother ride of larger wheels, and the convenience of one tube size and commonly available upgrade wheel sets. Taller folds have an easy time getting their feet squarely on the ground. The larger wheels help to tackle uneven road surfaces. Compared to other high racers, the Giro A26 is the robust choice, with high-grade components and disk brakes. With its mountain bike wheel size it is easy to find tires in a range of width to strike the right balance of weight and grip. We aren’t classifying it as a “fast bike” because its components are still aimed more at touring and practical use, but nothing stops this bike from being set up for speed. If you are looking for a fast urban commuter, and you want the transportability of the short wheelbase, and you want a more reclined seat than the Lightning Phantom, the Giro A-series bikes are worth a look. With the right choice of seat it is surprising easy to get your feet to the ground, for easy stops and fast starts. 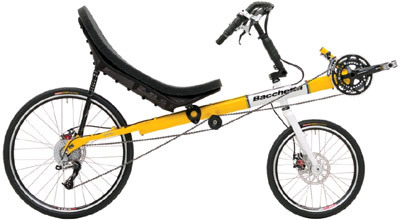 A recent innovation from Bacchetta is the Adroit rear dropout design. It won’t mean much to most people, but the fact is that there are two kinds of bicycle rear hubs… Road bikes use 130mm, so high-end go-fast rear wheels come that way. 135mm hubs are standard on mountain bikes, as well as most internally geared hubs. This design lets you mount either type of rear hub, allowing greater freedom in how you set up your bike. Like we said, most people don’t get into that kind of thing, but the option is yours. 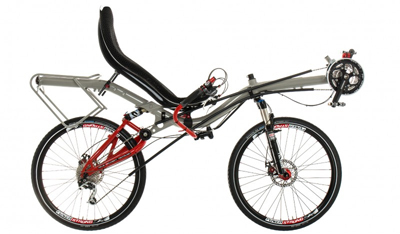 We supply the Giro A-series bikes with either the bigger ReCurve seat or the lightweight Euromesh seat. Big brother to the Giro-20, the “A” frame version of this bike is designed for the person who wants the perfect all-around ride and a no compromise spec. Not only does this bike take the rigors of commuting and touring head on with its time tested Bacchetta aluminum frame, its new Adroit dropout system, component groupo and price can’t be beat. With our new Adroit frame, top shelf components and Bacchetta custom aluminum tubing, the Giro A26 is a lightweight touring machine built to do it all. A long, self supported tour? No problem. Throw on your favorite set of go fast road wheels when you get back for some club riding? No problem. Bacchetta gives you the options you want! Front Derailer Microshift R439 SS - A brand you've never heard of, but a good quality, long lasting front derailer. Crankset FSA Comet 48/36/26T, W/Integrated BB - A triple crankset geared for climbing and carrying more that maximum speed. 170mm on short frame, 172.5mm on large frame. Cassette SRAM PG950 11-34t 9spd - A wide range, good quality freehub cassette. Front Brake TRP Spyre Mechanical - A brand you've never heard of, but they work fine. Giro A20: 26", Giro A26: 33" - The bigger front wheel naturally lifts the crankset higher. Seat Height Giro A20: 23.5" Giro A26: 25" - Seat height actually changes as the seat is moved on the frame for leg length adjustment. Ironically it gets higher up the shorter you are. We'd reckon seat heights range from 23 - 25" on the A20 and 24.5 - 27" on the A26. Wheelbase Giro A20: Small: 47", Large: 49" - This is the distance between the wheel hubs. Giro A26: Standard: 46", Large: 47"
Weight Giro A20: 28lbs, Giro A26: 29 lbs. 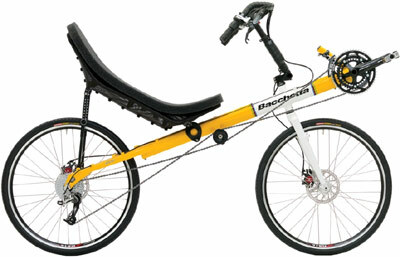 - This is weight without pedals and with the Euromesh seat. The ReCurve seat adds about 1 pound. Gear Range 18.7 - 106.8" - A decently low gear for climbing and hauling, with lower gears readily available. The high gear isn't up with the racing bikes, but it will get you down the road. Giro A26: Standard: 12.5" Boom - Large: 14" boom. - This is not a very important metric. But if you are trying to determine what size frame you have then this is the easiest to measure. The "boom" is the part of the frame that runs from the headset (steering axis) out to the crankset. Measure from the middle of the head tube to the middle of the bottom bracket shell. X Seam Giro A20: Small: 33"-45", Large: 42"-52" - See our guide on how to measure your ex-seam. Giro A26: Standard: 37"-46" - Large: 41"-50". - Note that the A20 fits both shorter and taller riders than the A26. We could trim about an inch off the minimum by using shorter crank arms.